As Bloggers, we make the decision to share ourselves with those on the other end of the computer screen. For some, this means sharing things about our lives and who we are. For others, it is just about our involvement with certain topics. But in this specific blogging and social networking community, we usually share most about our dogs. To many people, blogging is “putting your life out there for anyone and everyone to see” – a scary thought. For most of us though, it is a chance to build new relationships and bonds with people we probably would never have met otherwise (in person or online). I can’t even count how many friendships I’ve made through this blogging and Facebook community of people who stand for the same things I do. Furthermore, I can’t even begin to put into words how special they all are to me. With these friendships comes support and advice for your challenges, motivation for your struggles, and excitement for your victories – all from people who mostly only know you through the words you write online. We get so close to each other as we go through journeys together that we feel more connected than just as “fans” on Facebook, or blog followers. I feel like I personally know the people who are in this social media circle, as well as their dogs. So when someone in this blog family suffers a loss, we all hurt. We all watch as a dog we’ve grown to love through pictures and stories gets taken away from their family. We feel heartbroken because the loving people who have shared their dog and their lives with us hold a place in our hearts as cherished friends – even without ever meeting them in person. Blogging friends over at Pittieful Love suddenly lost their dog Knox this weekend to a rare blood parasite. 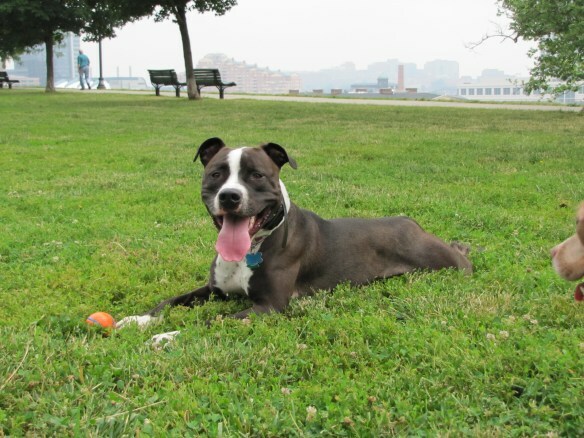 Knox was the quintessential happy-go-lucky pit bull type dog, with a big goofy smile and a blocky black and white head. Stories about the way he interacted with his foster siblings always made me smile, and the pictures were so “aww” worthy. It was easy to feel a connection with him because he was so similar to all the pitties we love in our own lives. Knox was also a blood donor, and of course a wonderful ambassador for the breed. Knox - Picture from Pittieful Love. So it’s easy to see why Knox’s passing has shaken the whole blogging community. If you’d like to head over to Pittieful Love’s Facebook page to learn more about Knox’s story and leave a note, I think it would mean a lot to Knox’s parents. If there is any positive in this situation, it’s you wonderful people who have come together to give words & thoughts of comfort to this family in a time of need. Thank you. This entry was posted in Dog talk, Rescue/Humane Society, Uncategorized and tagged advcoacy, blogging, community, family, goodbye, Knox, pit bulls, rescue. Bookmark the permalink. oh, no. A friend of mine just lost her dog suddenly to a similar blood disease. It was very quick. Oh my goodness…I hadn’t visited there in a few days–so sad. Going now. Thanks for sharing about poor sweet Knox. This gave me goosebumps over and over again… Thank you for this beautiful post. I’m completely awe-struck by the love and support… speechless. But thank you so much, this is a truly BEAUTIFUL post about this awesome and supportive community that feels more like a family. That’s awful. The thing about blogging is that it feels like you know the people and dogs in a more personal way than some of the people you know in “real life”. You know their problems and what they ate for breakfast. After reading about someone’s life every day for several months, they become friends. You miss them if they stop posting, and your grieve for their losses. I am so sorry to hear about Knox. His life touched so many people and he will be missed by readers all over the world.